Scottish inventor Alexander Bain patented a design in 1843 for an electric telegraph able to transmit images over wires. Meanwhile, the first patent for the telephone was obtained by Alexander Bell (another Scotsman, incidentally, who emigrated to the US), and not until 1876. Faxes also entered commercial use much earlier than phones. In the 1860s, on the Paris-Marseilles and Paris-Lyon lines, Italian engineer Giovanni Caselli set up his “pantelegraph” — a real, albeit rudimentary facsimile machine. At roughly the same time, an experimental facsimile line was laid in Russia linking the imperial palaces in St. Petersburg and Moscow. The world’s first commercial telephone lines started humming a decade later, in 1877. 2. Think no one uses faxes? Think again! Faxes may have gone out of fashion years ago, but they never went totally out of use: Go to the website of almost any large company or government agency, click the “Contact us” link, and you’re sure to see a fax number. That means somewhere in the bowels of the organization is an office with a fully functioning fax machine — even if it’s rather dusty. There might even be more than one. Skeptics who refuse to countenance that fax machines are still in operation should simply do an online search for working fax numbers. This query yields more than 400 million results in English, a whisker under 50 million in Russian, and an astonishing 300 million, yes, in Japanese. Turns out that in Japan, having a fax is still routine not only for corporate organizations, but also for individuals. The estimates vary, but it seems that faxes are still used in 40% to 50% of Japanese households. The basic document that defines faxing protocol goes by the name of ITU-T Recommendation T.30. Created in 1985, it governs the activity of manufacturers to this day. More than a dozen new versions and amendments have been published since, but even the most recent date back to 2005. Just in case you’ve forgotten, in 2005 the most modern operating system was Windows XP, the snazziest browser was Internet Explorer 7, and the world’s most popular mobile phone was the Nokia 1110. Not many people know (or care), but it’s possible to send color images by fax, not just grainy black and white. This feature found its way into the 1996 version of the abovementioned T.30 standard. What’s more, black-and-white faxes are transmitted in TIFF format, whereas color faxes use JPEG. Of course, not all fax machines produced post-1996 can transmit and print in full color — that depends on the specific model. But many of the devices in use today can. If truth be told, most organizations probably ditched their dedicated fax machines long ago in favor of more modern contraptions known as multifunctional printers (MFPs) or all-in-one (AIO) units that combine a printer, scanner, copier, and the dear old fax machine. These devices are basically computers. First, they are connected to a phone line for receiving and sending faxes. And second, they are often hooked up to a home or corporate network to provide easy printing and scanning. 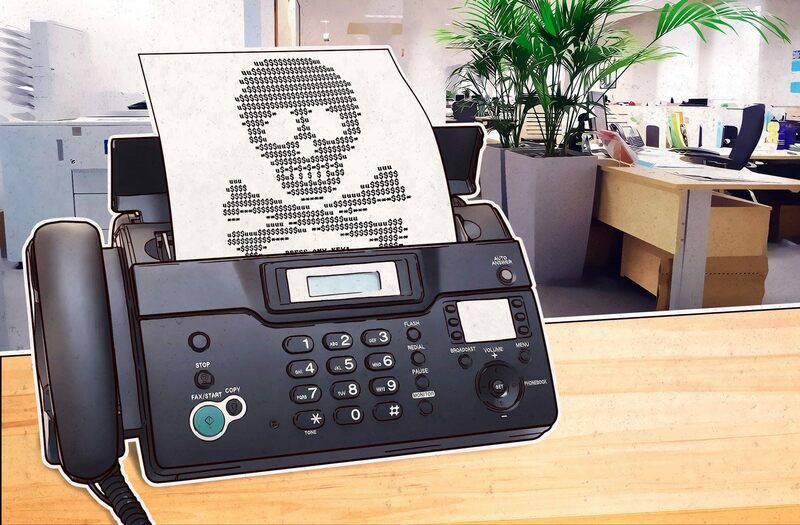 At DEF CON 26, researchers Yaniv Balmas and Eyal Itkin presented a report playfully entitled “What the Fax?,” in which they demonstrated how to hack a fax machine through a telephone connection. The guinea pig in the study was a cheap MFP made by HP. Although it took a while to study the MFP firmware, Balmas and Itkin eventually found a vulnerability in a device operating system module responsible for processing JPEG files received by fax. Using this vulnerability, they were able to gain full control over the MFP by means of an incoming fax. To demonstrate the potential consequences, the researchers used the EternalBlue exploit (well known after the WannaCry and NotPetya outbreaks) to infect a computer connected to the same network as the device. The team duly notified HP of their findings. Fortunately, HP took the vulnerability seriously, assigned it “critical” status, and promptly released some patched firmware for susceptible devices. Incidentally, the list includes about a hundred models, so if you use an MFP with a built-in fax machine manufactured by HP, we recommend that you take a look and, more likely than not, update its firmware. And while you’re at it, think about whether you actually still need such a stone-age means of communication. Perhaps it’s time to let go of the past?